YVC Affiliates include United Ways, YMCAs, Boys & Girls Clubs, volunteer centers, parks and recreation departments and other youth-serving organizations. Each YVC program looks a little different depending on the host organization and the local community, but they all implement the same program model and receive ongoing support and resources from YVC Headquarters. 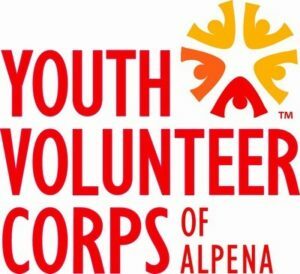 Youth Volunteer Corps of Alpena is part of a national nonprofit network called the Youth Volunteer Corps (YVC). YVC offers youth between the ages of 11 and 18 the opportunity to improve their community through volunteering. Learn more at www.yvc.org. Studies tracking youth who volunteer have found that they can develop negative attitudes about service if they don’t feel that their efforts make a difference. That is why Youth Volunteer Corps has utilized the same model for 30 years—team-based, diverse, structured, flexible service-learning opportunities for youth. Since 1987, Youth Volunteer Corps has witnessed more than 300,000 youth whose lives have been transformed by this model of service. The Youth Volunteer Corps Program is located at the Alpena High School-3303 South Third Street Alpena, MI-during the School Year and at the Boys and Girls Club of Alpena-601 River Street Alpena, MI-during the Summer. Contact Brooke Mainville at 358-5245 or call the Boys and Girls Club of Alpena 356-0214. The YVC program is a service of the Boys and Girls Club of Alpena. Younger generations have always inspired the rest of us to better our world. That kind of idealism can be infectious, and when paired with tangible service, real change can occur. The Youth Volunteer Corps of Alpena is the intersection of aspiration and action. Understand the needs of others. Since 1987, Youth Volunteer Corps has witnessed countless youth whose lives have been transformed by service – resulting in 4.5 million volunteer hours. Do rewarding work that helps meet your community’s needs. Studies tracking youth who volunteer have found that youth can develop negative attitudes about service if they don’t feel that their efforts are making a difference. That’s why YVC aims to ensure that every single youth has a positive experience volunteering through high-quality, team-based volunteer projects.